Larry Janesky and his company Dr. Energy Saver Home Services specialize in cellulose insulation. 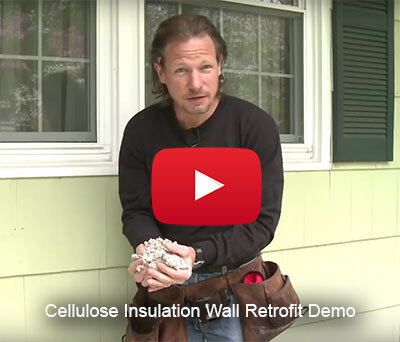 They have produced an excellent video on the process for retrofitting the walls in an older home with dense packed cellulose insulation. Many owners of older homes focus on the attic adding insulation to help improve the energy efficiency. It’s easy to check the attic insulation and add more as needed. But the fact is most older homes have insufficient insulation in their exterior walls as well. Even though having an insulated attic is important, improperly insulated walls will minimize the overall energy efficiency reducing the value of the investment in the attic. Depending on the square footage, there is often more total surface area in the walls than attics in homes. The walls in most older homes typically contain fiberglass batt insulation that simply does not seal the wall cavity, allowing air penetration. Dense packed Cellulose insulation is the perfect product for retrofitting insulation in the walls of older homes. A qualified insulation contractor, knowledgeable in this process with cellulose insulation, can evaluate the home and complete the retrofit without disruption to the interior space. Watch Larry’s excellent and entertaining video as he completes a dense pack wall installation. Then check with a cellulose insulation producer in your area for recommendations on contractors like him that can evaluate and retrofit the walls in your home with cellulose insulation. This entry was posted in Cellulose Insulation, DIY & Insulation Tips. Bookmark the permalink.